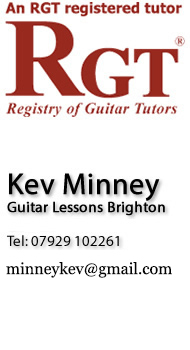 Guitar Tuition by Kevin Minney - DipLCM ALCM LLCM. Kevin Minney is a highly regarded professional guitarist and musician with over 18 years playing experience and 10 years teaching experience to professional RGT standards. Kevin is also well respected as a session player across the UK. He is fully RGT graded (Grade 8 with distinction) and has achieved several additional qualifications including the following: DipLCM (Diploma of London College of Music) ALCM (Associate dip. of London College of Music) LLCM (Licentiate dip. of London College of Music) Kevin can adapt his guitar playing to any style of music whether it be Rock, Pop, Soul, Funk, Jazz, Classical or Acoustic and always to a high professional standard. Over the past 10 years as a professional session guitarist Kevin has played with many well known bands and solo artists in venues across the UK. Most recently Kevin performed with: Up-and-coming Beatboxing star ‘Shlomo’ Bad Manners Adam Gammage (Baxer Dury, The Hours) Alan Wakeman (David Essex Band/Rick Wakeman) Toured as the guitarist for 80’s Rockabilly legends ‘The Jets’ stage show “Kings of Harmony” and many others. "In the 30 years I have been performing professionally, I have met some outstanding musicians, Kevin Minney is right up there with the best, a really talented and nice guy"
"I find Kevin extremely enthusiastic, A masterful player in various idioms on acoustic and electric guitars.. A musician who lives to play" - Alan Wakeman (Saxophonist Guru, David Essex Band) "A truly creative and gifted player"
"Kevin always fits in to my bass grooves .. 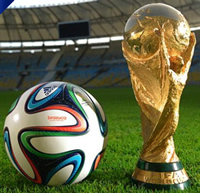 He is a very creative and intelligent player"
"Inspiring guitar player, easy to create music with, always to a top standard"
"I find Kevin extremely enthusiastic, A masterful player in various idioms on acoustic and electric guitars.. A musician who lives to play"
Kevin has recently played guitar for the BBC on their coverage of the Brazil 2014 world cup.